If you’re a nursing mom, you may be wondering how to eat to provide the best possible nutrition for your baby. The good news is that breastmilk is truly a wonder. For the most part, it gives your baby all the nutrients she needs regardless of what you eat. Mothers throughout history have produced nutritious milk for their babies, even in times of famine. Not getting enough nutrients while breastfeeding can affect your health. Your mammary glands, which are responsible for producing breast milk, pull from the nutrients available in your body. Generally there are plenty of nutrients for both you and your baby, but if a nutrient level in your body is low, your breastmilk gets first dibs. As a result, you may experience symptoms of a nutrient deficiency if you’re not eating enough healthy food. A note about vitamin D. In general, we’re spending less time in the sun these days. This has led to an overall decline in vitamin D levels. Ask your pediatrician about giving your baby vitamin D supplements, as the American Academy of Pediatrics recommends that exclusively breastfed babies receive them. Breastfeeding can be tiring, and the way you eat can boost your energy. Breastfeeding, especially around-the-clock in the beginning, is a lot of work! Top that with sleeping less and perhaps going back to work, and you may feel exhausted. Most experts recommend that nursing moms eat an extra 300-500 calories a day, not letting too much time pass between meals or snacks. If you wait too long to eat, your blood sugar may plummet and zap your energy. What’s more, you may end up overeating because you’re ravenous by the time you get around to it, which can leave you feeling sluggish. For sustained energy, skip processed food with simple carbohydrates like white flour and refined sugar. Instead, build your meals and snacks around a combination of complex carbohydrates (like fruits, vegetables, whole grains or beans), protein, and healthy fats (like olive oil, nuts, seeds, avocados and fish). These foods take longer to digest than the simple carbohydrates that can slow you down by causing your blood sugar to spike and crash. A note about fish: Experts recommend that nursing moms eat 8-12 ounces of fish every week. Fish (especially fatty ones like wild salmon) is a nutritional powerhouse of protein, nutrients, and two important omega-3 fatty acids (DHA and EPA). Certain fish, however, contain high levels of mercury. To help you choose wisely, the FDA and EPA joined forces to create a mercury level chart that you can print out and keep handy when you’re shopping for fish or eating out. Wondering how much protein and other types of food you need? The USDA has another great tool, MyPlate, that can help you figure this out. Too much caffeine or alcohol can negatively affect your baby. The American Academy of Pediatrics advises that “moderate consumption of coffee, tea…and an occasional glass of wine or other alcoholic beverage are fine when you are breastfeeding. However, some babies are more sensitive than others, so keep a close eye on your baby to see how she reacts.” Studies show that caffeine in breastmilk can lead to irritability in babies, and both caffeine and alcohol can result in poor sleep for baby. Generally, “moderate” consumption of caffeine for nursing moms is defined as the amount in up to five 5-ounce cups of coffee. On the conservative end, the recommendation for alcohol is no more than 2 drinks per week. If you do have a drink, experts say you should wait about 3 hours after finishing it to nurse your baby. This gives the alcohol time to leave your system. If you’re engorged in the meantime you can pump, but it’s a good idea to toss that milk as it may still have alcohol in it. When you hydrate, it’s best to go for a decaffeinated, nonalcoholic, unsweetened drink whenever you feel thirsty, which tends to be often for nursing moms. Although your body will generally produce enough milk for your baby based on how much she nurses, dehydration can affect your milk supply if it’s severe. Remember to talk to your doctor before taking supplements, and about any nutritional questions you have. 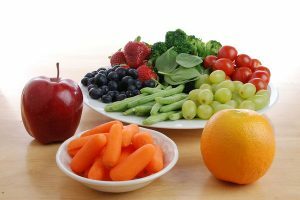 For tips about postpartum weight loss and more information on the link between food, energy and mood, see our article about general postpartum nutrition.